As Santa and his reindeer fly into the night, the Wonderland Express chugs its way round and round the peaceful little village nestled amongst snow-kissed evergreen boughs. Capture the joy of this wondrous night in your home with a Collectibles Market First Thomas Kinkade musical animated tabletop Christmas tree with moving trains and lights, available ONLY from The Bradford Exchange, Hawthorne Village Division. Showcasing four levels of rotating movement - including Santa and his sleigh - you'll watch as the train "climbs" ever higher up the tree and notice 12 brilliantly illuminated buildings and over 2 dozen handcrafted figures. Inspired by the Painter of Light's™ beloved artwork, this fully sculptural Thomas Kinkade animated tabletop Christmas tree plays a medley of 8 beloved Christmas carols. 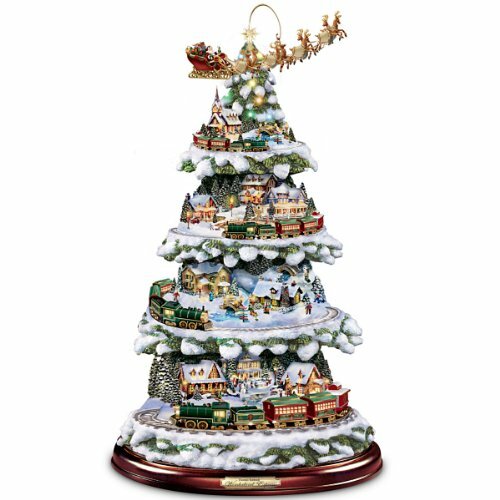 The title plaque on the base is inscribed with the words "Thomas Kinkade Wonderland Express"
Watch as the animated Wonderland Express train "climbs" ever higher up this tabletop Christmas tree while Santa with his reindeer "fly" round and round! If you have any questions about this product by Hawthorne Village, contact us by completing and submitting the form below. If you are looking for a specif part number, please include it with your message.